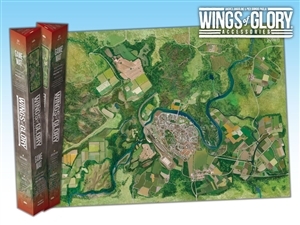 The new Wings of Glory® game mats are a modular system designed to provide you with the ultimate gaming surface for your aerial battles, suitable both for WW1 and WW2 gaming. Three different styles are available – Countryside, City, and Coast – each of them compatible with the others. You can join two, four, or even more, Game Mats together, in the combination you prefer, to create a larger battlefield.